The course of Vale de Lobo, which hosted, in 1987, the Portugal Ladies Open (part of the WPG European Tour) has matured since its inauguration in 1966. Originally, the course had 18 holes, designed by Sir Henry Cotton. 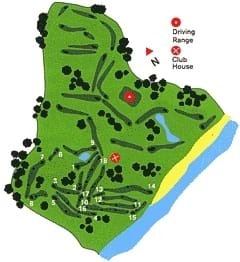 In 1972, however, a loop of nine holes was added to the course. Recent works have given it further new dimensions - two courses of 18 holes (The Ocean Course and the Royal Golf Course). The 5,493 metre Ocean Course was created by joining up the "green" and "orange" courses. Its sandy fairways undulate alongside pine, olive, orange trees and eucalyptus. Vale do Lobo, which is the focal point of a sophisticated tourism complex, is only 20 km away from Faro International Airport, and also has a good sized 245 m practice course, creating excellent training conditions.